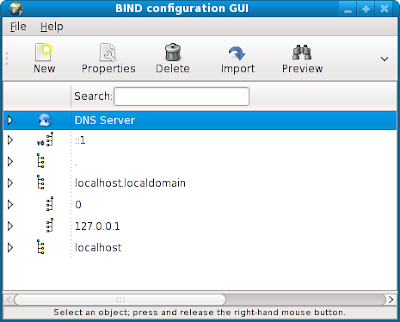 Here is how I set up a domain name server with BIND on Linux Fedora 10. One of the features many websites use to personalize their content is to give users their own domain name, for example bunwich.blogspot.com or bunwich.mysite.com. This technique is called wildcard subdomains. In this tutorial, I'll be explaning how you can configure a nameserver to resolve all these addresses to the same server. You'll need to use mod_rewrite and .htaccess to parse the data, and the scripting language of your choice to refine the arguments even more. (I'll write these later ones when I have some time. system-config-bind - a not so intuitive gnome tool to setup your DNS server. I'll paste the output files that it produces in case you want to do it all by hand. /var/named/chroot/var/named/ - directory of where the system-config-bind writes all the zone files to. mysite.com is the domain I'm going to use to refer to my server. service named restart. You should receive OK messages. What we want to do next is to get our domain name server to resolve to an IP of our choice. I'm going with my lan IP as I'm using this for testing. You will get this window. Make sure mysite.com. has a period after the com. Take note that the period is added to the end of mysite.com. 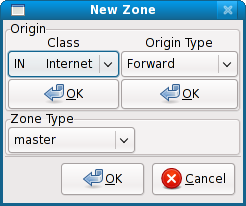 On the main GUI click and the Save Button. The .db file will be written. Associate our name server to an IP. A IPv4 address. The pop up on the right will appear. Enter your ip address. Note that the domain name mysite.com. has a period on the end too. 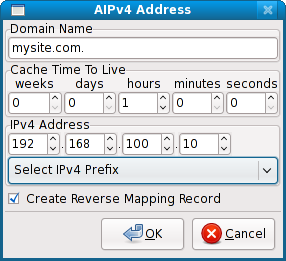 We select Create Reverse Mapping record for our ip and a zone will be created for it on our name server. On the main GUI click on the Save button. Finally the wildcard setup. 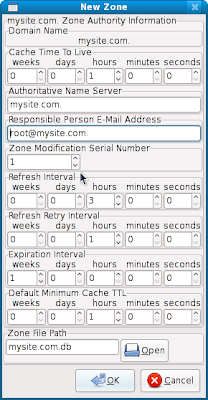 Right click on mysite.com, add a new A IPv4 Address. Fill in the info with a wildcard and deselect Create Reverse Mapping Record. Refer to the image on the right. Note: if you're using network manager or system-config-network, add 127.0.0.1 as your name server. 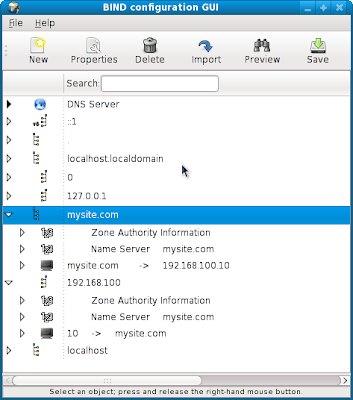 You should now be able to ping and nslookup mysite.com or ftp.mysite.com and be directed to 192.168.100.10. As long as those computers use this nameserver. As promised before here are the configs in the conf and zone files.